General Description: Rainbow Hot Springs is a primitive and isolated riverside hot springs. Hike through the Weminuche Wilderness Area within the San Juan National Fores north of Pagosa Springs in Colorado. But the soak is well worth the 4.5 mile (one-way) hike. The hike is breathtaking and has exceptional views through forests of pine and aspen groves. You are rewarded with a primal hot springs beauty in which your body can soak off the long climb. Location: From Pagosa Springs, Colorado it is about 25 miles or 40 minutes. Directions: From Pagosa Springs, Colorado take US 160 (16 miles) to the sign for West Fork Campground. Take Campground road (CR 648) (7 miles) until you reach the West Fork Trail-head parking. Accessibility: Check road conditions before attempting to go. you can drive up to the trailhead on paved road. Park at West Fork Trail-head. 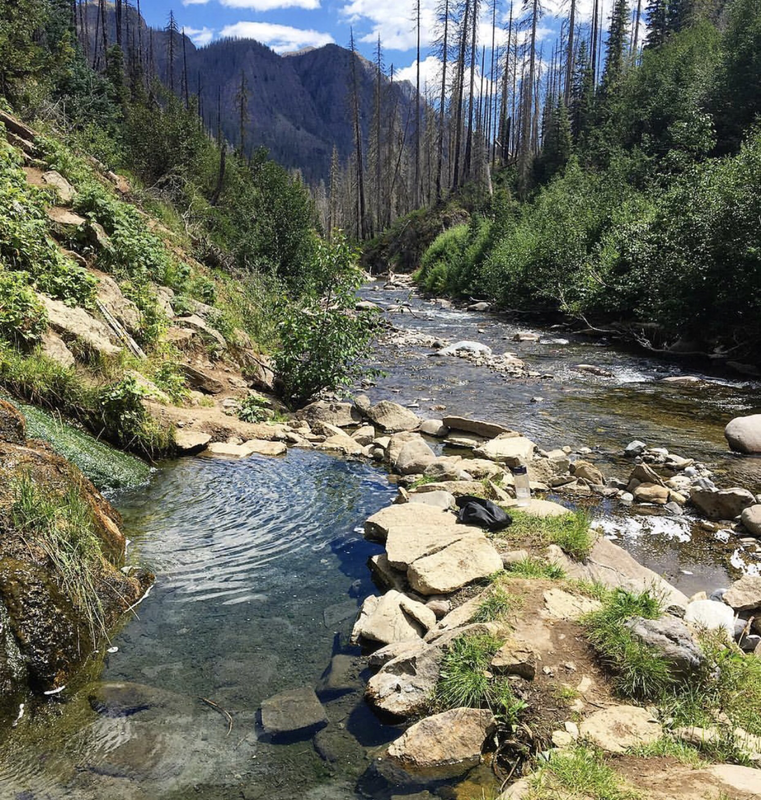 The hike is 5.1 treacherous miles to the springs and follows both the west fork of the San Juan River and Beaver Creek. It takes about 5-8 hours . The hike gains 1,000 feet in elevation. Following the West Fork Trail to the hot springs. Hot Springs: Rainbow Hot Springs has two rock walled primitive pools. The sizes change with spring runoff from the West Fork San Juan River and volunteer building. The source of the hot springs is about 110 degrees. The upper pool is about 8ft x 4ft and closer to the source of the hot springs. It’s temperature is 105°F. Temperature changes with the season and size. The lower pool is the larger. It’s about 20 ft x 8 ft. This pool lies directly on the shore of the river and averages around 95°F. Hot Spring Tips: ​This hot springs is dog friendly. Clothing optional. Dogs need to be leashed. This hot springs is free. Camping is permitted around the hot springs. Most of the trail has no tree cover, sunscreen recommended. Bring enough water and supplies. The hottest pool is the one across the San Juan River, but it washes out frequently. The Summer through mid-Fall is best. The upper parts of the trail are generally covered with snow from Late November through mid-June. Youtube Video on Rainbow Hot Springs is below.